Reliance JIO is on fire with its unbelievable and amazing offers and plans. At the Reliance Annual General Meeting on Thursday morning, the Chairman and Managing Director of Reliance, Mukesh Ambani officially announced the launch of Reliance Jio. Mr. Ambani said that his goal is to acquire 100 million customers as soon as possible. 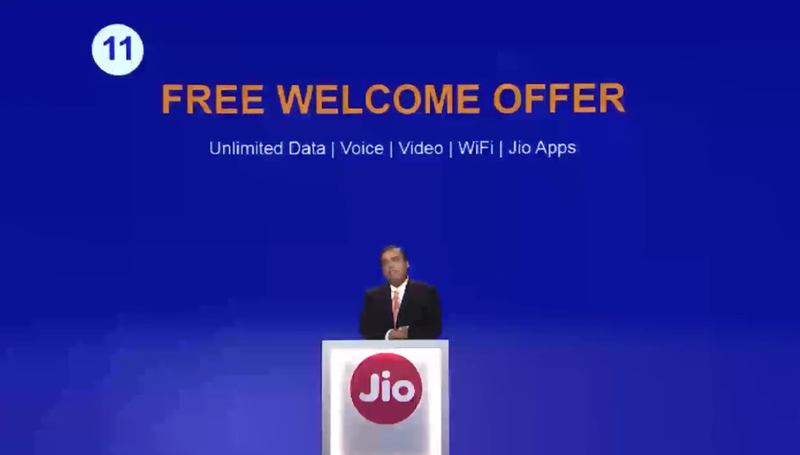 After the exciting Jio Preview offer, Reliance announced a new Jio Welcome offer. So the people who are still planning to buy the Jio SIM can go through the FAQ and clear their doubts here. Q) If you already are on Preview offer, you will be migrated to welcome offer? Ans- If you are an existing Jio Preview Offer customer, you will be automatically migrated to the Free Welcome Offer on 05th Sept, 2016. As a part of this Offer, you will continue to enjoy unlimited HD voice & video calling, unlimited SMS, high-speed data and access to a host of Jio premium apps till 31st Dec, 2016. Q) What is Jio Welcome offer ? Ans- If you are an existing Jio Preview Offer customer, you will be automatically migrated to the Free Welcome Offer on 05th Sept, 2016. If you get a Jio SIM as part of the Free Welcome Offer, you will enjoy HD voice & video calling, unlimited SMS, high-speed data and access to a host of Jio premium apps till 31st Dec, 2016. Q) Will everything be free for Jio Preview and Jio Welcome customer till 31st December ? Ans- Yes, till 31st December 2016, everything including calls, data, Wi-Fi, apps, will be offered for free of cost. Q) What will happen to my 3 month free data,calls and SMS after 31st Dec? Ans- After 31st Dec, 2016, all the free data offers will be deactivated even if you have used just one month or one day of data. Q) Does Jio Welcome offer provides unlimited 4G data ? Ans- No, Only 4GB of 4G data is free in one day after that you will get a speed of 128kbps. Q) What are the JIO tariffs avaialable ? Ans- JIO tariffs available from Rs 19 to Rs 4999. Read this article to know more about the plans or refer the images below. Q) What’s the minimum tariff plan available ? Ans- Lowest tariff plan starts from Rs 19 which comes with 1-day of validity. Q) Does every tariff plan offers Unlimited 4G data at night ? Ans- Apart from Rs 149 tariff plan, every other tariff plan offers unlimited 4G data at night. 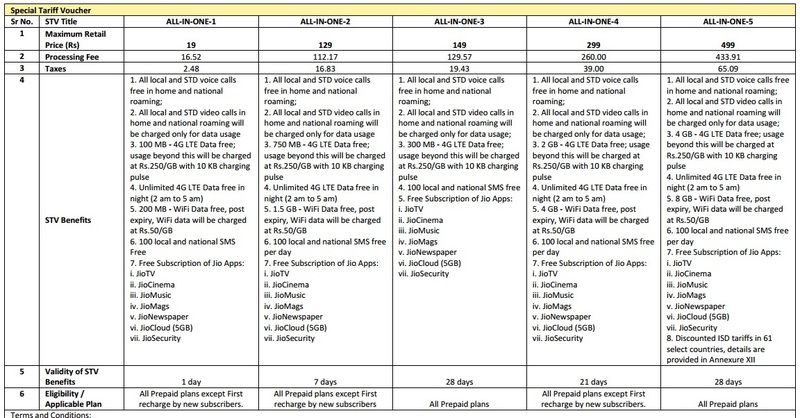 Q) Does every tariff plan offers Unlimited SMS pack ? Ans- Apart from Rs 149 tariff plan, every other tariff plan offers unlimited SMS. Q) Does every tariff plan offers Unlimited calling ? Ans- Yes, every pack offers Unlimited calling in Local, STD and roaming to any network in India. Q) What time will be considered for the Unlimited data in Night ? Ans- From 2 am to 5 am. 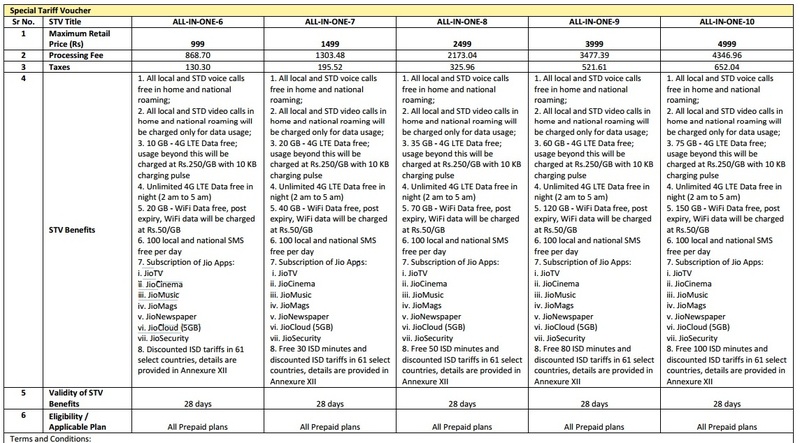 Q) What will be the charge if you exhaust the offered data ? Ans- Usage beyond the offered data will be charged at Rs.250/GB with 10 KB charging pulse. Q) What is WiFi data ? Ans- Wi-Fi data benefits in the plans pertain to Wi-Fi data availed in the Public Wi-Fi hotspots of RJIL. Q) What are the offers for students ? Ans- 25% additional 4G WiFi data benefits will be provided to students on providing a valid identity card, as per process. Q) Any rule for the first recharge ? Ans- The prepaid packs with denominations Rs.19, Rs.129 and Rs.299 cannot be availed as a First recharge by new subscribers. Q) Do we get subscription to the Jio apps ? Q) Can I port my number to Jio ? Ans- Yes you can. To port in, send PORT Mobile Number to 1900 from your existing number which needs to be ported to Jio. Download MyJio app from Play Store and generate offer code. Visit nearby Reliance Digital with the port out code and your Free Welcome Offer code along with the handset. Q) Can I covert my SIM from prepaid to postpaid or vice-versa ? Ans- Yes. You will be required to fill a Migration / CAF and provide a new set of PoA/PoI documents. If you are an existing Jio Preview Offer customer, you would be migrated to the Free Welcome Offer. However this service is currently not available and would be available shorty. Q) Is there any Prepaid Special Tariff pack for Audio and Video Conferencing ? Ans) Yes, there it it. The Audio conferencing pack costs Rs 49 and the video conferencing pack costs Rs 99 and both pack are valid for 28 days. Refer the image.